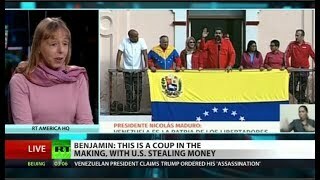 "Hands off Venezuela" March in Washington: Background and Repercussions~Is Trump Trumping the Monroe Doctrine? Yesterday, Saturday, March 16, 2019, there were huge marches and demonstrations in Washington against Trump's economic sanctions and pressure for a regime change in Venezuela. What is the prize in this instance? What could be more obvious? We are not talking about growing bananas in Nicaragua. Closer access to Venezuela's vast oil reserves because of the potential of installing our own puppet head of state, Juan Guaido. This is really nothing new for Central America or South America: the US has been manipulating entire nations' governments really going back to the Monroe Doctrine in 1823. "All over downtown Washington, any day of the week, there are people eating out of garbage cans, begging for change, doing whatever they can just to survive. So when they say they care about humanitarian aid, where's the humanitarian aid for the thousands of homeless people in the D.C. region? They say money is more important than people and they want you to think that they're in Venezuela for some sort of humanitarian reason. It's a complete and total lie." "There is nobody in that White House or in this administration that cares at all for the Venezuelan people. That has been made so clear by the sanctions that they have introduced that are designed precisely to strangle the economy and designed to make life miserable for the Venezuelan people." Brian Becker of ANSWER Coalition warned that the U.S. must conclude all of its efforts to take away the determination of the Venezuelans who their democratically elected leader should be. "The U.S. government, whether it's Trump or the equally imperialist Democrats, have no right, no capacity, no competence to tell the people of Venezuela who their president is or what their government should look like. Only Venezuela can determine the destiny of Venezuela." Protesters had many signs that asked that the U.S. repeat the same errors that the Bush administration made in Iraq and that many more Americans should to speak out against U.S. potentially engaging in military action in Venezuela. The Monroe Doctrine delineated U.S. policy toward the Western Hemisphere. It was buried in a routine annual message delivered to Congress by President James Monroe in December 1823; the doctrine specifically warns European nations that the United States would not tolerate further colonization or puppet monarchs. At the time, that was an entirely appropriate position in our nation's foreign policy; in 1823, the US had perilously reached the tender age of only 34 years, This was still in the aftermath of the War of 1812 after the US had already survived a second attempt by Britain to reconquer the US, as well as repercussions of the Napoleonic Wars which for example had caused the Portuguese Royal Family to pull up lock-stock-and-barrel and move their empire to Brazil.